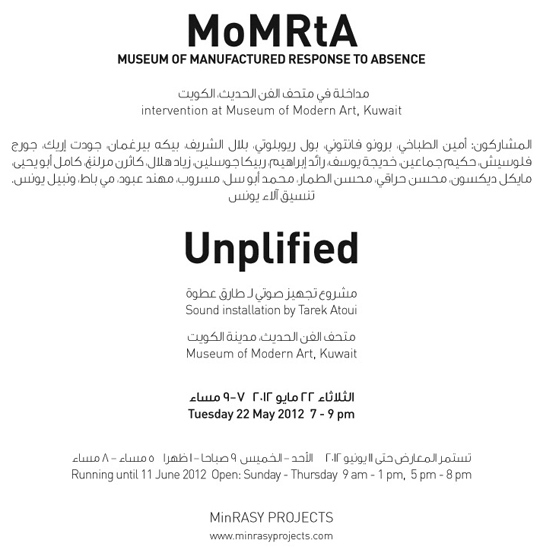 Under the patronage of the Kuwait National Council for Culture, Arts, and Letters, the Museum of Manufactured Response to Absence (MoMRtA) premieres as an intervention at the Museum of Modern Art in Kuwait on May 22, 2012 at 7 pm. MoMRtA is conceived in response to the present-day absence of Palestinians in Kuwait, who formed a vibrant community from their arrival in 1936 until their departure enmasse following the Iraqi invasion in 1990, and of documents relating to their history. The Museum of Manufactured Response to Absence questions the impact of the presence or absence of minority communities and subcultures on the nations they take residence in. In specific, MoMRtA investigates the unchronicled impact of this unique Palestinian society that emerged in Kuwait. Historically, the State of Kuwait was exceptionally receptive to large waves of Palestinian immigration due to its support for the Pan-Arab movement and its adoption of the Palestinian cause. Palestinians first arrived in Kuwait as visitors involved in educational missions around the time that oil was discovered in the Burgan Field in 1938. As a result of the 1948 and 1967 wars, more Palestinians settled there, and by 1990 Palestinians in Kuwait numbered 400,000. As Kuwait’s national development plans were set into motion, Palestinians found themselves players in the construction of modern Kuwait, while expectantly awaiting the materialization of a state of their own. MoMRtA’s exploration is conducted through a collection of 28 commissioned objects that purposefully conjure the fading of, and thereby recall, the golden era of Kuwaiti and Palestinian-Kuwaiti society. In light of the lack of collective images, narratives, and archives, memory is taken as the main point of reference for the museum’s objects. Fragile and fragmented, this is a memory that has been accumulated, dismantled, reassembled, and at times lost. MoMRtA includes works by Kamel Abu Yahya, Mohamed Abusal, Pieke Bergmans, Bilal Chrif, Cevdet Erek, Bruno Fantoni, Mohssin Harraki, Raed Ibrahim, Hakim Jamain, Rebecca Joselyn, Katharine Morling, Paul Rioblotti, George Vlosich, Khadijeh Yosef and Nabeel Younis. sound installation by Tarek Atoui opens at the same venue as MoMRtA. Inspired by Ghassan Kanafani‘s novella, Men in the Sun, which is a work of Palestinian literature in the Kuwaiti consciousness, Atoui researched his work, in December 2011, by the same means that the men took. He boarded a water tanker in Kuwait and made the journey from Basra to Kuwait. Atoui’s observations of the desert had been drastically different from Kanafani’s description of 50 years ago. Signs of modernity had set in. Atoui’s experience encompassed a desert inhabited by telecommunication antennas, factories and oil pumps, certainly more signs of life than men in the sun experienced. By closing his eyes, through sound, the desert manifested itself; an immense acoustic void where all sounds lose their spacial qualities, absorbed and not reflected. For Atoui Kanafani’s characters’ pleas, in the empty water tanker, would have been unplified; quietened and swallowed by the desert. Did the sound conditions in the vastness of the desert seal their fate? Atoui poses the question: Can human intervention amplify the desert and change its sonic quality? He parallels this with the paralysis of the Palestinian condition. This should be an extraordinary exhibition, I hope everybody will attend !